Burn out might sound like an extreme stage to get to. But not everyone has an Arianna Huffington moment, waking up on the floor after passing out from exhaustion. 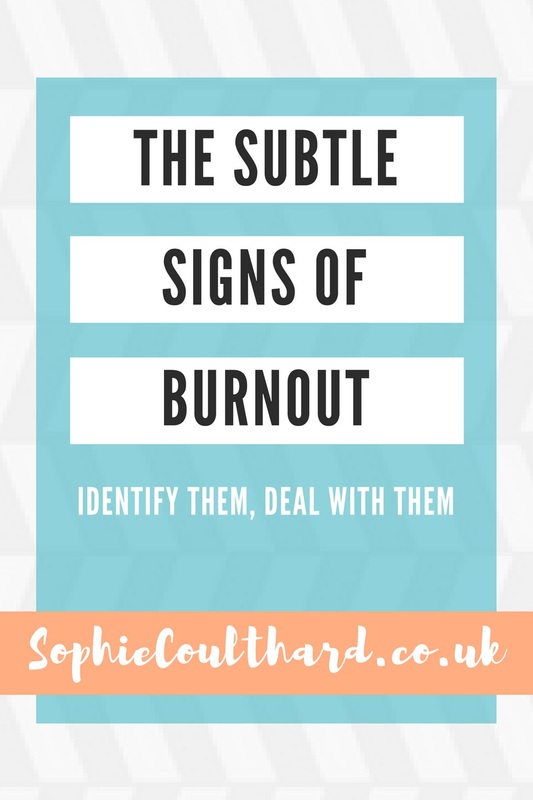 So let's get into what burnout actually is and what causes it and I'm going to reference stress too, as it's certainly possible to have both, and it's important to understand the cause and effect that comes with having one or the other. Have you considered this? Lazy people don't get burnt out. Why? Because they're not striving to succeed or putting any pressure on themselves. The don't criticise themselves when they don't complete something (or they wouldn't be lazy surely?) so they are happy working their way through life in a state of "chill" and as a result of this they will never feel burn out. It's important to recognise that when you're feeling burnt out; you got to this stage because you've been over working yourself, it's not a failure; it's just a consequence of pushing too hard. They're highly motivated - often overly motivated, meaning they take on too much and set goals without considering how large they are. They are very independent problem solvers, they are more than capable of sorting their own stuff out, meaning they may not always ask for help when they need it. They're very self critical, beating themselves up if they don't tick every box on their list. They've got a strong sense of what is important. They can clearly see what needs attention and are focused on getting through it. Now a person can operate like this - it doesn't necessarily mean they're going to get burnt out. But we all handle pressure differently and it's about learning what is going to tip the scale from coping, to not coping. Judgement can start to get clouded which means bad decisions get made. Self esteem starts to be impacted as self criticism increases. Focus and concentration gets unsteady. Intuition can get weaker and trusting the "gut instinct" is impossible. I could list at least ten other things that can be impacted when energy is down. It really does depend on the person although the list demonstrates what common effects are shown in the results. If that energy level stays low and nothing changes then these effects can become more and more damaging and impact on someones success. That's if they haven't already. If there's one thing that can turn a slight lack of energy into full blown burn out it is stress. Let's not forget that stress could have been there from the beginning already contributing and I want to take a minute to talk about stress and how it goes hand in hand with burn out. The Judgement Index categorises stress into either "work-related stress" or "personal stress". Work related stress is what it says on the tin; stress caused by the pressures of work, and when the lack of energy/burnout signs are there, then nine times out of ten so is the stress. When this is at a low level then I often describe it as a person who is juggling, spinning a few plates and their energy might be down slightly, they may not be as sharp as they normally are. But when the stress is increased and the energy is impacted then this person might be starting to drop those plates and the chances are it's affecting other areas of their judgement and behaviours, as described above. If burnout is work related then how does personal stress affect it? Personal stress can have a huge impact on someone and their ability both inside and outside of work, or it can be kept very well hidden. I often meet people who's Judgement Index report shows a significant personal stress and they tell me that no one at work knows about it at all. People can quite often go to work and mask whatever is going on in their personal life. In fact, work can often be an escape for someone who has personal stress. Just to clarify; when I talk about personal stress this can be a major life event such as a death, divorce, illness etc, I quite often see relationship issues or people who have parents that are ill. But it can also be something considered less major like a new baby keeping everyone awake or worries about money; something that causes a low or moderate anxiety level on a daily basis. People like to keep work and personal life separate. They might think they can. But at some point, personal stress may just creep under that work door. If you add work-related stress and burnout into the mix, then a person with both really does have no escape or down time, and that can be a very dangerous place to be. To catch the signs of burn out early you really need to know yourself. You need to know the level of work pressures that are likely to cause it and what the signs are for you to look out for. Are you turning to the Red Bull to fuel your waning energy? Have you been less intuitive and not noticed things that you usually would? Are you finding hard to stay focused and concentrate properly? Are you operating at a much slower pace at work and struggling to stay clear headed? What's been the cause of the low energy? What are the signs you're close to burnout? What effect is it having on your work and the things you're normally strong at? The Judgement Index is a great place to start if you really want to get to the bottom of why you're close to burnout. It measures over 50 areas of your values-based behaviours and judgement capacity, and will tell you exactly where you are on that energy scale and the likely effect it will have if you don't tackle it. If it's time to really address why you're suffering and take action before it impedes your own success then enquire today about taking the Judgement Index.